The stock market has been moving higher for now. Seasonal trends are bullish into the end of the year and the current market action suggests a stronger than average move is possible. That means now could be the ideal time to hunt for short term trading opportunities in volatile stocks. Volatile stocks can deliver the most “bang for the buck” and in an up trend, these stocks could deliver gains that beat the market, especially when they are bought on a dip. The dips could be due to profit taking and provide a chance to buy at a relative bargain price. On Tuesday, Corcept Therapeutics Incorporated (Nasdaq: CORT) opened lower. There wasn’t any news to explain the decline. That indicates it was most likely caused by short term traders who are taking profits. The stock is up more than 170% since the beginning of the year. The longer term chart shows that the stock has been a market leader for the past three years. CORT is up more than 600% in that time. The large gain in the stock appears to be justified by the fundamentals. The company has one drug on the market and additional candidates in its pipeline. Corcept Therapeutics is a pharmaceutical company engaged in the discovery, development, and commercialization of drugs for the treatment of severe metabolic, psychiatric and oncologic disorders, with a focus on disorders associated with the steroid hormone cortisol. The company has one drug on the market. Korlym was launched in April 2012, and was the first FDA-approved oral therapy for the treatment of patients with endogenous Cushing’s syndrome. Cushing’s syndrome is a rare condition that is the result of too much of the hormone cortisol in the body. Cortisol is a hormone normally made by the adrenal glands that allows people to respond to stressful situations such as illness, and has effects on almost all body tissues. When too much cortisol is made by the body itself, it is called Cushing’s syndrome, regardless of the cause. Some patients have Cushing’s syndrome because the adrenal glands have a tumor(s) making too much cortisol. Other patients have Cushing’s syndrome because they make too much of the hormone ACTH, which causes the adrenal glands to make cortisol. When the ACTH comes from the pituitary gland it is called Cushing’s disease. Korlym is a glucocorticoid receptor antagonist that is indicated to control hyperglycemia associated with Cushing’s syndrome, a rare, debilitating endocrine disorder. Analysts believe the drug has significant potential. Corcept is following a standard model to commercialize the drug by hiring medical liaisons who help patients with paperwork for insurance and sales representatives to help doctors understand the potential benefits of the drug. Cushing’s syndrome is being diagnosed in more than 3,000 new patients annually in the U.S. This means the company’s efforts to increased awareness among physicians and patients about the drug and expanded sales efforts should boost sales, going forward. Corcept is also seeking to expand sales by finding how the drug could be useful for additional indications. It is conducting a phase I/II safety and efficacy study on Korlym in combination with another drug for the treatment of triple-negative breast cancer (TNBC). In another series of tests, the University of Chicago is conducting a phase II study on Korlym, in combination with a drug made by Pfizer, for the treatment of metastatic, castration-resistant prostate cancer. The institution also plans to conduct a phase II study on Korlym, in combination with Celgene’s CELG Abraxane, for the treatment of patients with TNBC. Corcept is also evaluating a new drug candidate for Cushing’s syndrome and a range of solid tumors. Management reports that early data on the candidate for Cushing’s syndrome has been quite promising and the company expects to expand the test by the end of 2017. Three additional preclinical drug candidates are expected to enter the clinic in 2017. These factors have all contributed to the stock’s rally. Financials have also been a positive influence on the stock price. Recently, the company raised its 2017 revenue guidance. Now, Corcept projects revenues to be in the range of $125 million to $135 million more than its prior expectation of $120 million to $130 million. Analysts expect earnings per share of $0.76 this year and $0.96 next year. CORT is expected to report earnings after the close on October 31. The official date has not been announced and the announcement could come a few days earlier or later. History tells us that this report could be bullish for the stock. The company has exceeded analysts’ earnings expectations seven times in the last eight quarters. On average, the stock rallied 8.7% in the week after the earnings announcement. To benefit from potential gains in CORT, an investor could buy shares of the company. This requires a significant amount of capital and exposes the investor to standard risks of owning a stock. 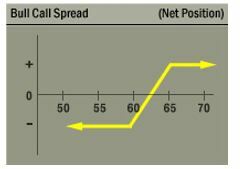 This options trading strategies is designed to profit from a gain in the underlying stock’s price but has the benefit of avoiding the large up-front capital outlay and downside risk of outright stock ownership. The potential risks and rewards of this strategy are summarized in the chart below. For CORT, the November 17 options allow a trader to gain exposure to the stock through the earnings report and the next week. A November 17 $18 call option can be bought for about $2.00 and the November 17 $20 call could be sold for about $1.00. This trade would cost $100 to open since each contract covers 100 shares of stock. For this trade in CORT the maximum gain is $1.00 ($20 – $18 = $2.00; $2.00 – $1.00 = $1.00). This represents $100 per contract since each contract covers 100 shares.